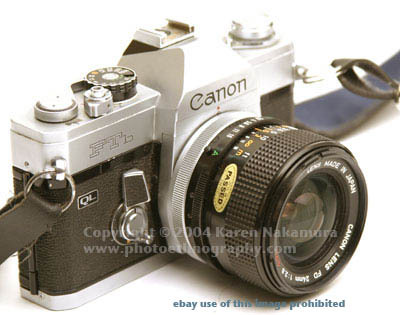 The Canon FTb is a manual focus SLR that was introduced by Canon, Inc. in March of 1971. 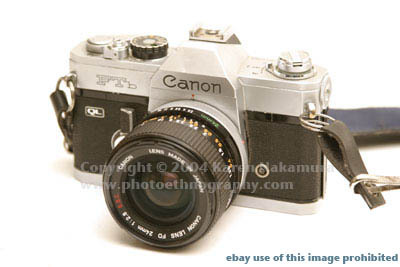 It was introduced alongside the professional-level Canon F-1 and was intended for advance amateur use. 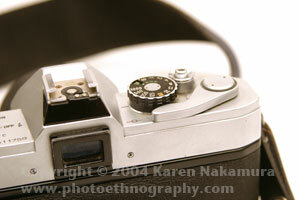 It was a solid, well-designed camera that has withstood the test of time. It has quite a cult-following among Canon FD-lens afficianados. Using the text or images on this website without permission on an ebay auction or any other site is a violation of federal law. 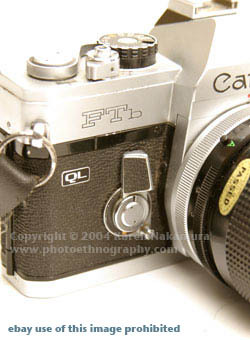 The Canon FTb later morphed into the Canon TX, which I also have written up. With either version, the self-timer lever has multiple functions. It doubles as a stop-down metering lever. Pushing it in towards the body stops the lens down and also lets you meter with older FL lenses. The FTb also has true mirror-lockup. Not mirror pre-fire like many contemporary cameras, where the mirror goes up a few seconds before each shot, but comes down again, but true mirror lockup. The mirror locks up and won't come down until you tell it to. This is great for instances when you want to mount a non-retrofocus wide-angle lens in the camera, and want the mirror to stay out of the way. Note: Using this chart or any of the text or images on this site in an ebay auction without permission is copyright violation as well as a violation of your ebay Terms of Service. I will report you to ebay if I discover such a violation taking place.